Alison Parker (Christina Raines) is a young model who rents a suspiciously cheap apartment in an old Brooklyn brownstone. The brownstone has only one other tenant, a blind Catholic priest named Father Halliran (John Carradine) who lives alone on the building's top floor. We ultimately discover this brownstone is a gateway to Hell, and Father Halliran is responsible for keeping Hell's minions from storming the gate. His tenure is nearly over, though, and it's time to pick his successor. Could that be why Alison got such a great deal on that apartment? 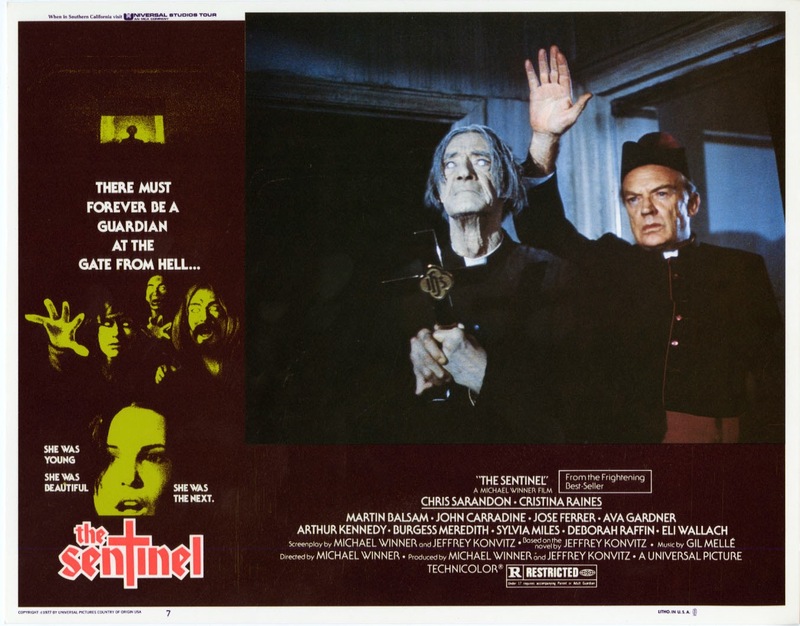 The Sentinel (1977) is cut from the same cloth as films like Rosemary's Baby (1968), The Exorcist (1973), and The Omen (1976), but it possesses a quality its predecessor's lack. It's skeevy. Universal was clearly aiming to get some of that supernatural box office mojo for itself, but The Sentinel simply couldn't generate the same level of prestige and box office success enjoyed by its forebears. Based on a popular novel of the same name by Jeffrey Konvitz, blessed with a then huge production budget of $3.7 million dollars, and loaded with more famous faces past and future than you can shake a crucifix at, The Sentinel somehow still manages to play out like a copycat Italian exploitation picture with a more anglicized cast and better production values. That exploitative quality is simultaneously the movie's curse as well as its saving grace. Beverly D'Angelo paying her dues in The Sentinel. Director Michael Winner populated the movie's finale with deformed people and circus freaks to represent the minions of Hell, even though a similar casting choice made by Tod Browning for Freaks in 1932 effectively ended the director's career. Winner also doesn't shy away from truly bizarro moments like the scene in which a spandex clad Beverly D'Angelo masturbates furiously in front of a mortified Christina Raines for no apparent reason save shock value. If that doesn't do it for you, how about the scene in which a room full of dead murderers throw a birthday party for Burgess Meredith's dispeptic cat? The Sentinel is often an incoherent, exploitative hot mess, but it never fails to hold one's attention. If none of these admittedly dubious charms does it for you, though, you can always just marvel at how many recognizable faces The Sentinel serves up. The jaw-dropping cast - from the leads all the way down to the supporting players - make The Sentinel a cinematic who's who of fading names and rising stars. In addition to the previously mentioned actors and actresses, you'll also see Chris Sarandon, Jose Ferrer, Martin Balsam, Ava Gardner, Arthur Kennedy, Sylvia Miles, Deborah Raffin, Eli Wallach, Christopher Walken, Jerry Orbach, Jeff Goldblum, and Tom Berenger. How's that for a star studded cast? 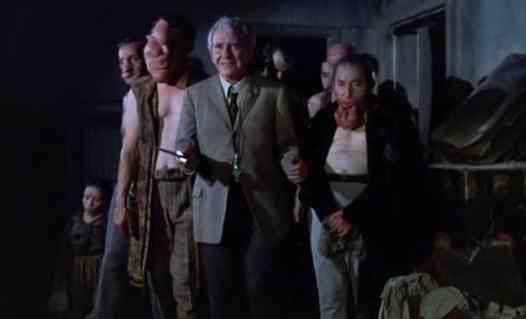 Burgess Meredith and the deformed minions of Hell. The Sentinel isn't as good as the movies it emulates, but it's compulsively watchable and criminally underrated. Even Universal is still presumably a little embarrassed by it, as evidenced by the no-frills DVD release and lack of availability on Blu-ray. Hell, even movies as bad as The Slumber Party Massacre (1982) get the hi-def treatment now, so why no love for this also ran of the seventies satanic sweepstakes? Obviously, then, The Sentinel makes a fine choice for the fourth and final 100% Guilt-Free Movie Pick for Movies At Dog Farm III. Sorry to be so late with remarks on this one. Things have been crazy. The Sentinel sounds like a hell of a movie (pun...). I need to look this one up now because I don't recall seeing this. The character of the blind priest proves interesting, and I wonder if Donald Pleasance's character in Prince of Darkness plays any sort of homage. Come to think of it, End of Days has a similar motif. I'll have to develop that idea one day. What a cast of characters. I must say that Beverly D'Angelo looks like Zelda Rubenstein in the picture you presented. BTW--you must share how you get your awesome screen caps. Now I must go search for this movie. Thanks for the heads up! The Sentinel is a lot of fun, but I should temper your expectations a bit. John Carradine's priest has almost nothing to do with anything save looking spooky in the top floor window until the tail end of the movie. In fact, many of the "names" are little more than bit parts. I don't think Chris Walken even has any dialog, Tom Berenger only appears for a couple of minutes in the movie's coda, and Jeff Goldblum's character was dubbed with another person's voice. The screen caps this time are only the result of much Google image sifting, although I thought I was going to have to pull a screen cap from the disc for that Beverly D'Angelo shot. I'm pretty sure the disc is still readily available for less than ten bucks. I love The Sentinel. And as you pointed out, it's criminally underrated and has not received a proper beefed-up release. For now I'll hang on to my DVD, but I really hope to see Shout Factory get their hands on it and give it a nice remastered Blu-ray/DVD combo release with a badass cover. I always drew connections to The Beyond, but that's probably a bit of a stretch. Really great movie though for almost inexplicable reasons. Great write-up Brandon, and since I seem to have missed something along the line, what is Movies at Dog Farm III? Are you having a local live showing? The only Blu-ray of The Sentinel I could find was (I think) a German release that was outrageously expensive. I don't think the connection to The Beyond is a stretch at all. I was considering The Beyond for an "After Midnight" slot until I realized just how similar they are. And yes, Movies At Dog Farm III is a (semi) local event - the third one, natch. I'll be going to my friend Phil's dog boarding facility today - the real world Dog Farm - to present movies. Phil has a gathering for photographers, models, etc. once or twice a year over the course of a weekend. My contribution is kind of like the freakshow tent on the midway. I take a front projector, and we watch movies outside on the big screen in the evenings. This Dog Farm event is actually the origin of this blog, although this is the first one we've had since the blog went live. I wish you and Carl and my other friends on the internet could join us. It's a good time! Oh yeah I remember you mentioning that when you first got started. Sounds like a lot of fun, I really wish I could make it! Hope it goes well man! You are absolutely right that in some respects The Sentinel cannot touch the movies it's trying to emulate. It's no where near Rosemary's Baby or The Exorcist. However, the fact that it IS skeevy is one of the very reasons that I love it so much. It really puts it in a class by itself. Everything from the aforementioned Beverly D'Angelo masturbation scene to the circus freak hell minions. There's a dirty, almost grindhouse vibe to the film and THAT is what makes it such a stellar film! Shout Factory needs to get their hands on this! I often forget that many of the films I watch, love and talk about are more 'cult' and obscure than I think. Sometimes I forget that not everyone has watched Slave Girls From Beyond Infinity, The Day Time Ended and Laserblast as many times as I have! I know I'll never look at Beverly D'Angelo the same!